Everybody loves an epoxy garage floor. It gives the floor a high-quality finished look, is easy to clean and lasts forever. For a long time, the only way to get a beautiful epoxy garage floor was to hire a professional installer who was trained in the chemical interactions of epoxy, hardening agents, cement and urethane. 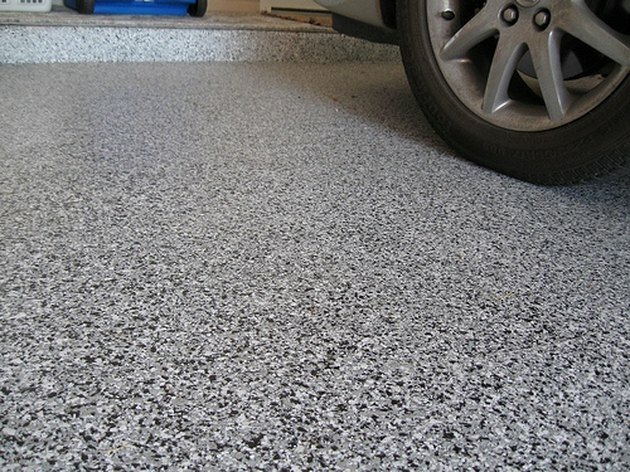 But today, with do-it-yourself epoxy floor kits available, there's no excuse for not having a perfect garage floor. Unless something goes wrong. If you prepare a concrete floor properly, mix and apply the components according to instructions and wait 24 hours, you will have a beautiful floor that will last for years. In reality, you may have a beautiful floor or you may have islands of tacky epoxy that refuse to dry. There are two main reasons an epoxy floor doesn't dry completely. Each brand of epoxy floor paint has a preferred temperature range for both mixing and application. If either temperature is out of range, or very near to the extremes of the range, the epoxy and bonding agent may not completely mix and interact. If the outside temperature or floor temperature are out of range, the mixture may not cure and harden once it is applied to the floor. The installation instructions outline timing requirements that are critical to the chemical interaction between the epoxy paint and the bonding agent. The two components must be mixed thoroughly, but without creating bubbles. Once mixed, the mixture must be allowed to sit and "cook". This is the time when the chemical interaction takes place that turns the two components into one cohesive unit. Once combined, the newly created compound must be applied to the floor before it has time to harden too much to spread properly. If the entire floor, or most of the floor, remains tacky after the manufacturer's stated drying time, the cause is almost assuredly a cold floor. The epoxy compound will harden at the proper temperature, but drying will slow down, or even stop, if the floor is too cold. When the floor temperature rises to within range, the drying process will resume. If the floor dries unevenly, or there are tacky spots remaining, the cause is improper mixing. You may have followed the directions exactly, but for some reason, the compound didn't completely mix evenly throughout the can. If the tackiness is caused by a cold floor, either wait until the floor temperature rises, or heat the room air until the floor dries. If the tackiness is sporadic, caused by uneven mixing, the uncured epoxy paint may be removed and covered with a new application of properly mixed epoxy paint. Scrape and wipe up as much of the tacky epoxy paint as possible. If epoxy residue is left on the floor, the new epoxy will bind with it. Dave Hallier is a freelance writer and journalist. After graduating from the Southern Ohio College, he wrote for local newspapers in Ohio and Kentucky. For the past few years, he has concentrated on freelance writing, specializing in travel, home improvement and sustainable agriculture. He has written articles for publications such as Ladies Golf Journey, Green Living and A Better Way. Why Is My Interior/Exterior Semi-Gloss Sticky?